Overview: Police scientist Barry Allen leads a pretty slow life. He has a girlfriend, reporter Iris West, but he constantly shows up to their dates late. When working late one night, a freak bolt of lightning strikes the police lab, and Barry Allen finds himself doused in a unique mix of chemicals. As a result, Barry finds that he can run and move at super speed. Barry develops a special suit and borrows the code name from his favorite comic book character, and a new Flash is born. So begins the Silver Age of comics! In the 19 issues of Showcase and The Flash, we are treated to an incredible development of a character and his supporting cast. We are introduced to Iris’ nephew, Wally West, who happens to be the president of his local chapter of the Flash fan club. In a near duplication of the same unique accident, Wally finds himself covered in the same chemicals, making him the Kid Flash. Another hero is introduced when Julie Schwartz wanted a Plastic Man-type character, so John Broome and Carmine Infantino introduce the Elongated Man, who broke with tradition and embraced his celebrity by not having a secret identity. More importantly, we meet the core group of villains which would torment Barry (and later Wally) for years to come. The Flash’s Rogues Gallery is just as great as those of Batman, Superman, and Spider-Man, with the majority of them introduced in this very volume. Why should these stories be Showcased? : This is a great volume, and these stories should absolutely be showcased. Barry Allen’s Flash is truly a science fiction hero disguised in a super-hero comic. With his super-speed, he can travel anywhere in the world in a blink of an eye. Heck, he finds he can travel in time and between worlds just by altering his internal vibrations. His scientific knowledge is just as key to solving some cases as is his speed ability. Flash Comics: This volume contains the Golden Age Flash story from Flash Comics #104. Even though the book was Flash Comics, it was an anthology title featuring stories featuring Hawkman, Black Canary, the Atom, Johnny Thunder, and other Golden Age heroes. Issue #104 was the final issue of Flash Comics. 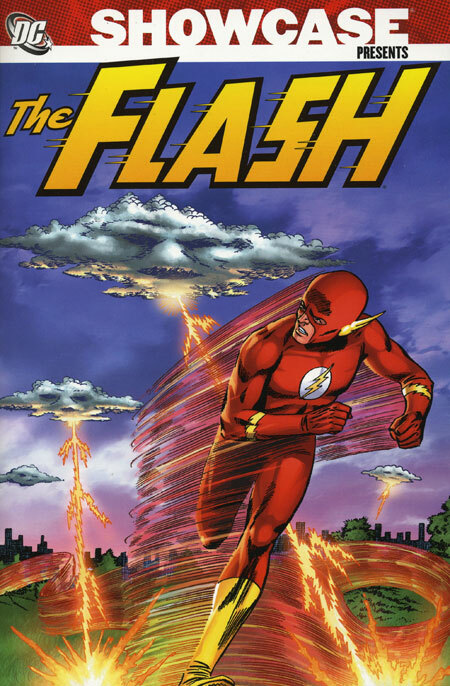 When DC decided to give Barry his own title in 1958, they named his book The Flash. The book took over the numbering from the defunct Flash Comics, so the first issue of the ongoing Barry Allen series is #105. Footnotes: Showcase #4, #8, #13, and #14 are also reprinted in Showcase Presents Showcase Vol. 1. The Flash #112, #115, and #119 are also reprinted in Showcase Presents Elongated Man Vol. 1. If you like this volume, try: Tom Kater’s podcast series, Tom Vs. The Flash. Kater used to run a blog where he would write reviews of the original Justice League of America series. He switched formats midway through the JLA run, going away from the blog and doing the reviews as podcasts. When he finished Tom vs. the JLA podcasts, he then started the Tom vs The Flash podcasts. These podcasts reviewed the early Showcase issues, and then Flash #105 to #350. When he finished Flash, he moved over to Aquaman, and most recently Jimmy Olsen. His podcasts offer brilliantly witty reviews and observations on the comics, pointing out the plot holes and the absurdities of the comics. These podcasts can still be found as free downloads on the iTunes podcast store, so track them down and listen to the podcasts while reading this volume. This entry was posted in DC Showcase Presents, Flash and tagged Carmine Infantino, Flash, Frank Giacoia, Joe Giella, Joe Kubert, John Broome, Murphy Anderson, Robert Kanigher. Bookmark the permalink. Pingback: Throwback Thursday – Showcase Presents The Flash Vol. 1 | WORST. COMIC. PODCAST. EVER!